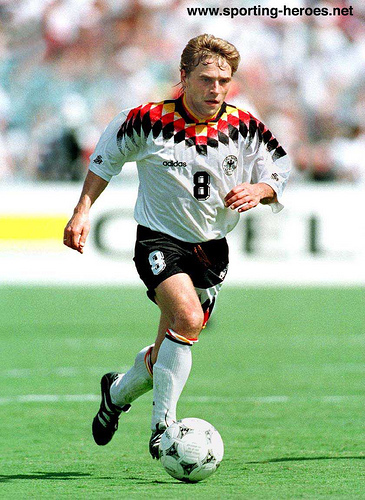 With the German national team, Häßler won the 1990 World Cup and Euro 96. Disappointed about his season in Dortmund, Häßler left the club towards Bavaria and signed a contract with 1860 Munich. He spent four very successful years in Munich and became an important part of the team. Already in his first season the club reached a sensational fourth place in the Bundesliga. After they failed to win against Leeds United in the qualification for the UEFA Champions League, Häßler and his team participated in the UEFA Cup. But also with 1860 Munich he failed to overcome the competition's third round. In the following two years, the club took part in the UEFA Intertoto Cup but didn't manage to succeed. After the 2002-03 season, Häßler left Munich to finish his career in Austria. For Germany, Häßler was capped 101 times, scoring 11 goals. Other than the two major tournament wins, he also played for his country at the 1994 and 1998 FIFA World Cups, Euro 92, Euro 96, and Euro 2000. He also won a bronze medal for West Germany at the 1988 Summer Olympics. He was the dominant figure of the Euro 92, displaying performances that were reminiscent of Diego Maradona's 1986 World Cup exploits. He displayed a specialty for scoring spectacular free kicks, tireless stamina and dazzling dribbling sprees.